I fixed that bug just now and uploaded a mini-update. It includes your name in the credits! Download it from the same link as before. Thanks! Also, I notice that you're using my Celebi Shrine too (same one that Liquid Crystal uses). Haven't seen what you listed for my credit so I guess just "some tiles" or something would be most accurate. I tried to open the rom up in Advance Map to see if I noticed any other tiles to mention after we talked about New Bark. It didn't seem to render them correctly in Advance Map, so I just decided not to go that route and that I would just make a note of them if I came to any others. Anyway, still looking good and feeling accurate. I'm enjoying this hack a lot. Keep up the good work mate. (Well, some of it pops up here and there because it got included in that mega tile sheet). But nice to see them in a hack that gets a lot of attention.. Worst part is I was like 11 years old when I came across that tilesheet. Jesus christ you really are old. I made them back in... '05 or '06, so like my sophomore or junior year of highschool. But yeah, I guess I am getting old especially for the Pokemon hacking community. I'll be 25 in March, so I guess I am getting old compared to some of you guys. I know Cartmic and Koolboyman are around my age (although slightly older since they are already 25) but we're the exception. But I'lll try to keep from dragging this off-topic. Also, diegoisawesome: since I notice that the other towns use houses that are 4 tiles wide, but New Bark uses 5 tile wide houses because of the weird way that I made the houses (I wasn't exactly paying attention to how the 8x8 tiles would go since I made them for RPGMaker instead of a rom) I would be willing to rework them a bit to let you make them fit the narrower style the other towns use if you want. Honestly, several other buildings of mine that I made back then could benefit from some reworking because of the same reason I'm sure. Just let me know if you want me to do that for you. The Advance-Map stuff is because I changed the amount of tiles in the primary tileset. You can fix it, but I don't remember how ATM. No thanks, I've had the houses that width for a while, even before your tiles. It just works, what with the lab being the width that it is. Thanks for the offer though. The intro sequence works fine after saving with the GB Player enabled. Other minor fixes I can't remember right now, but they're there! As always, download from the same link in the first post. The bags have gotten a new coat of paint, especially the female bag (which was broken in the bag update). Various bugs have been fixed from reports by various people. As always, the download link's in the first post! How did I not know this existed before? :0 It looks so good- I'm going to be using this mod for a new Wedlocke challenge series on Youtube; only a small channel, so it won't be huge publicity, but I hope that it can get a few more to play it for themselves. Keep up the good work! Thanks man! Enjoying the 'Locke so far! Yeah, you read that right. The old and buggy Ruins of Alph puzzles from the first beta of CrystalDust are back, and this time, they don't break everything when used. On top of that, the braille on the walls of the chambers has finally been replaced with proper Unown text like they were supposed to be this whole time! Also, here's some more cool new stuff! 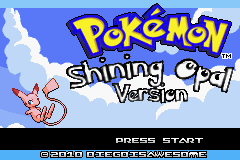 The title screen now uses a better font! Thanks to FredrIQ for finding it for me. Kris has a new sprite, obtained by MrAPT1! Using the Escape Rope inside of the first cavern shows the proper earthquake animation upon reentering. A tile error at the Lake of Rage was fixed. As usual, the link's in the first post! Last edited by Diegoisawesome; 3rd May 2014 at 05:03 AM. The best hack based on the second generation! Already have the system in which Pokemon appears only at night? Because it always seems to be the same. I just downloaded this hack and this is very awesome and stable. The only thing I encountered so far is that, I never encountered a Hoothoot in the first route after New Bark Town(I was playing at night). I just wondered why? Is this a bug?